This time of year is super busy at work for me. So I try to plan ahead, schedule future posts and find guest bloggers to fill in during the lag. Today I have Jumpin Jammerz as a guest blog...because really? Who doesn't love footed PJs. Being with someone for a long time can be both a blessing and a curse. It’s a blessing to have an awesome person in your life, but over time you might find a little bit of that spark fading. You might find that the spontaneity has seeped out to let predictability take the stage. Don’t worry though, it’s possible to rekindle the flame! Here are some ways to breathe life back into your relationship. Do a little Role Playing - Role playing gives you and your spouse a chance to let loose for a little while and act like someone other than you. 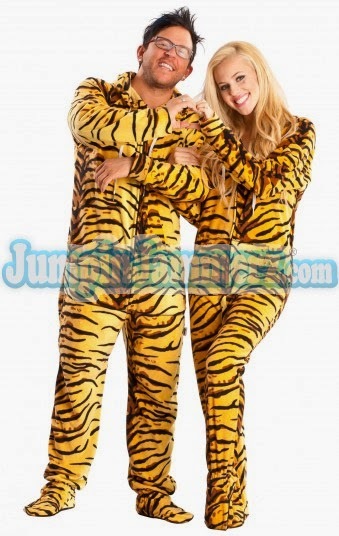 If you feel like bungling in the jungle (thank you, Jethro Tull), take a minute to put on matching tiger-striped onesies for adults, or whatever else suits your fancy. Women’s and Men’s footed pajamas are super comfy for prowling around the house. Take some photos to capture the moments! Rekindle the best parts of your relationship by taking a few moments to delight in exploring their needs and desires. Change up the pattern! With only a little bit of effort, you can reap a lot of reward with your partner. Change Patterns - As we live with our partners, we start to develop patterns. Break those patterns to add spontaneity to the relationship! What do you do when your person gets home? How can you make their experience a little better? Surprise yourself and your partner by doing something completely different. Take Up a Hobby Together - This shouldn’t be a hobby that the both of you have already. This is a hobby that neither of you have, something that you can learn together. If the both of you are competitive, you might learn the nuances of a board game or sport. Maybe learning how to do stained glass? When you’re learning together, you’re also growing together. Lounge Together - For those who don’t want to take up a sport, lounging around in your women’s and men’s footed pajamas is the perfect thing to take your mind off of the stresses of the day. Everyone has the ability to lounge and laugh. Watch a silly sitcom together, or try watching some foreign films and talk about them afterward. Keep Trying - Never give up trying to reconnect. Flowers, chocolates, and other little things can be given at any time – not when trying to atone. You can get the both of you a gift like the sushi onesies for adults or maybe commemorate a love for wrestling with John Cena men’s footed pajamas.